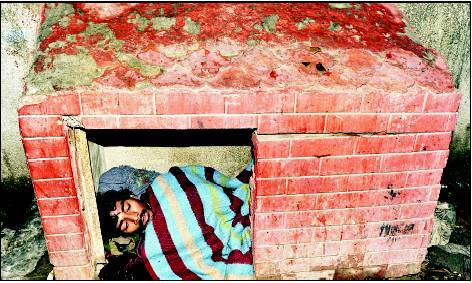 New Delhi: Every winter, the city wakes up to the untold miseries of homeless people. Many of them die on the streets braving the chill. A study on the 92 people who died without a roof over their heads from January 2011 to date, offers a glimpse into their tough lives. The Mother NGO at St Stephen’s Hospital recorded the deaths, but it couldn’t document those deaths that were reported directly to the police. While this showed the absence of an official mechanism to coordinate between different sources when it comes to recording deaths, the study also brought to the fore the need for a uniform system to take care of the homeless. Many more are dying on the capital’s streets and many need immediate intervention, as revealed by Delhi Police data from five districts. Over 6,800 deaths on the streets of Delhi, including those of the homeless and unidentified persons, have been reported between 2007 and 2011. This information was provided by the police in reply to an RTI application filed by activist S A Azad from the Campaign for Rehabilitation of Homeless People. The St Stephen’s Hospital data reveals that cold is not the only thing killing those on the streets. But it is certainly a trigger that aggravates latent ailments among the homeless, estimated to be anywhere between 60,000 and 1 lakh. Tuberculosis, addiction to drugs and alcohol, and respiratory problems are some of the unattended yet treatable illnesses that are claiming the lives of those sleeping rough on the streets. The absence of Delhi government-driven health facilities is seen by NGOs as a cause for concern. 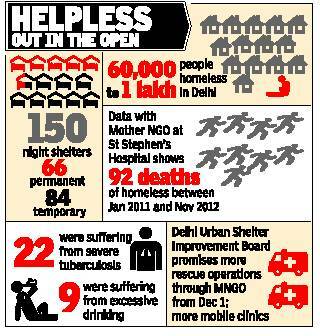 Delhi Urban Shelter Improvement Board CEO Shakti Sinha told TOI that he will discuss the matter with the health secretary to make provision for mobileclinics. “We will also step up rescue operations through the MNGO from December 1,” he assured. Tuberculosis tops the list when it comes to common causes of deaths as per the MNGO data. Of the 92 dead, 22 were suffering from severe tuberculosis. In 12 cases, excessive drinking has been blamed for accelerating death. Nine deaths have been attributed to cold. The causes of death vary for the others, ranging from asthma, mental illness to weakness and burn injuries. “These deaths include cases where either the rescue team of the MNGO found the person in distress on the street or reached him through calls made to the homeless helpline. The list has cases where homeless persons died in hospitals after being rescued or succumbed to a long-drawn illness at a night shelter. The list also has deaths where the cause is unknown,” Dr Javed Khan from St Stephen’s said. He pointed that the analysis reflects that those on the streets need better access to medical facilities and more focused rescue operations supported by the state. Paramjit Kaur from Ashray Adhikar Abhiyan who has been leading a community outreach clinic near Jama Masjid for over 11 years points that chest infections including tuberculosis are most common among the homeless. “Poor nutrition increases chances of TB. Skin infections and occupational problems like aches and pains are other concerns,” Kaur added. She feels that state intervention in providing health facilities to the homeless to prevent deaths is the need of the hour. Meanwhile, a statement issued by human rights forum of NGOs under the banner of Shahri Adhikar Manch: Begharon Ke Saath cites the police data on 6,800 deaths to drive home the need for development of a line of accountability for such deaths and to prevent further deaths. The activists have also demanded that the Delhi government develop and implement a human rightsbased long-term plan for the city’s homeless, which includes creation of adequate permanent shelters. According to Indu Prakash Singh from Indo-Global Social Service Society, the police data of 6,800 deaths of homeless and unidentified persons is alarming and needs to be studied in detail. “Also adequate response from NHRC, National Commission for Women and Delhi Commission for Women is the need of the hour including provision for disaggregated data on homeless persons, protecting the rights of the homeless and their rehabilitation and housing,” he added. 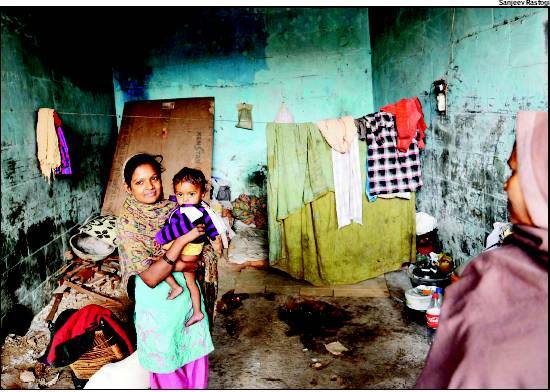 New Delhi: The next time you apologize for your home looking like a dump, spare a thought for Shobhraj Kumar. Most people who hurry past the garbage dump at Masjid Moth would find it difficult to stand there for a few minutes because of the all-pervading stench. But for Shobhraj and his family of six, the dump is home. The 62-year-old says he has been living in the 20 sq ft concrete dhalao (dump) for the better part of 38 years. Shobhraj Kumar was one of the lucky few slum-dwellers to be allocated a flat at Madanpur Khadar in 2003. But Kumar, who earns around Rs 2,800 per month, found he could not afford the daily commute from his new home to Masjid Moth. So he returned to live in the dump.Kumar turns philosophical when told that living in the dump was a health hazard. “God is different for the poor and the rich. Rich fall sick often as they can afford the treatment. The poor are blessed with a strong immunity. Despite living in a dump, me or my family do not fall sick very often,” he says with a smile. Kumar says he lived in a Nehru Place slum cluster for a while after his elder son’s marriage. When the slum was removed he got a oneroom flat at Madanpur Khadar. The family has two mattresses on which Kumar’s wife and daughter-in law sleep with the grandsons. “There are plywood and cardboard sheets on which I and my son sleep. The MCD toilet is our bathroom but during winter things get tough as there is no hot water. We boil water and then take a bath. It’s more difficult for the women,” says Kumar, as his grandson plays with stray dogs coming to the dump for a meal. The Khadar flat is occupied by Kumar’s elder son. That’s house the Gorakhpur-born Kumar mentions when anyone asks for his address. The younger son lives with Kumar. His daughter-in-law, after a bit of coaxing, opens up to TOI. “I didn’t know that I will be living in a koodaghar (garbage dump) after marriage. But life here is better than in Gorakhpur. We at least have electricity and the garbage here better than at my father’s jhuggi back home,” says Anjali, who married Kumar’s son four years back. The family has taken a line from the pole and a bulb illuminates the dump at night. The winters are particularly harsh in the dhalao. The family cannot burn garbage to keep warm as residents in the nearby DDA flats have a problem with the smoke. Many residents of the flat sympathize with the family. But for others, they are encroachers. “There are people living in much more worse condition but living in the dhalao is actually encroachment. We have so many times brought this matter up with DWM but to no avail. Even the police have not acted,” says an RWA member of the DDA Flats, Masjid Moth Phase-II. DWM is the private agency that looks after garbage disposal in the area. The RWA member said if any one complains about Kumar and his family, he stops picking garbage from that house. DWM supervisor, Rakesh Kumar, has his own version. “The family is nice and decent. They don’t create problems. I have so many times asked them to move. The RWA members have never approached me saying they have a problem,” says the supervisor responsible for garbage management of Masjid Moth, Phase I & II. Residents say they have been others like the Kumar family who have made the dhalao their home. “Till recently, people were living in garbage dumps at Malviya Nagar and Sheikh Sarai. But after complaints to area MP Ajay Maken, these dumps were cleaned up and locked. They (people living in the dhalao) create so much nuisance,” says Keshav Aggarwal of Chittaranjan Park.